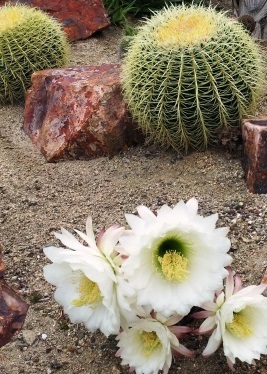 This month's Featured Garden is Rowland's garden in Escondido. Located on a hillside just west of Kit Carson Park off Bear Valley Road, this house has ½ acre of varied plantings. 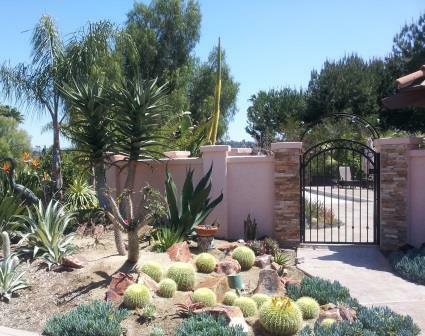 The front is planted in succulents, palms, and trees with many varieties of aeoniums, euphorbias, dudleyas, aloes (including Goliath and Hercules), agaves, coprosma, salvias (far from the aloes), agonis, arbutus, kalanchoe, vitex, vriesea, and many cacti in pots and in ground. The pool area has a area with an underwater theme, a raised area with cycads, Bismarckia palm, Birds of Paradise, bromeliads, aloes, and aeoniums and a shaded area with hydrangas, camelias, and other shade loving plants. A rose garden accents the outdoor living space and down the slope are vegetable gardens, citrus, avocados, and native plants along with bamboo and flowering trees. The Rowland’s garden was created over the past four years. The garden was done in phases and grew as they found new things to plant. They move and remove plants as needed to improve appearance, fill in gaps, or remove those victims of their resident gopher(s). Stacy Moser from Plans for Plants Landscape Design did the original design, but they modified the design as they did the actual work. The actual work and continued consultant/pruner/friend/acquirer is Lou Renter from House of Tropics, but the Rowlands do a lot of the light work themselves.